Yum! I've been wanting to try a dessert in my crock pot, and this one sounds like just the thing for a cool fall night! Thanks for sharing! yum. i love pumpkin so i will definitely have to try this! Looks awesome! Yummy! I just joined your blog from a link party. Hope you will stop by my blog and join if you'd like! Love your blog! this sounds yummo! i love pulling out all the pumpkin recipes in the fall!!! thanks for sharing! Your article is truly relevant to my study at this moment, and I am really happy I discovered your website. However, I would like to see more details about this topic. This looks so yummy! I am "pinning" to try later. You have a darling blog- so glad I stopped by from Sugar Bee Crafts link up! I love the ease of using my crockpot. What a great recipe. I'm visiting from the bloghop and am now following you. I would love it if you followed me back. I am soooooo trying this! 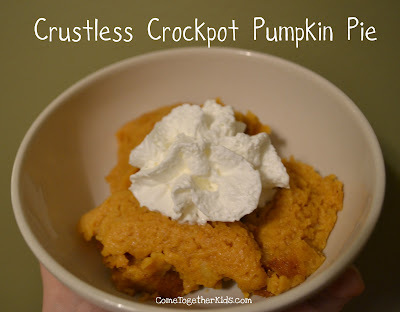 I adore pumkin pie, and to be able to do it in the crockpot?!? Priceless. Love that website! Pumpkin pie is the only pie where the crust isn’t my favorite part...so I can’t wait to try this! I made this gluten free by using a GF baking mix. I also used fresh pumpkin. It is cooking as I type. Coconut milk makes it sweeter, along with stevia instead of sugar. for students,So hire our expert assignment writer and do best in your college and school. Our assignment experts are continue working 100% plagiarism free work. Want to get How To Avoid Plagiarism Essay Then simply check the Students Assignment Help and solve all your doubts. We work continue and giving original work. This is very useful post for me. This will totally going to help me in my endeavor.